A campaign group has claimed it’s just not cricket - after its bid to protect playing fields at Cleadon was postponed after a council blunder. Oakleigh Gardens Community Action Group was set to tell a public inquiry tomorrow (NOTE – Weds) the land should be given village green status. Doing so would protect the Oakleigh Gardens site from potential future building development, which its members say is imperative. But they have hit out at South Tyneside Council after the hearing was cancelled at the eleventh hour. Council chiefs have admitted they were late in submitted essential representations and evidence to an independent inspector. Group representative Lilian Milne claims two deadlines – one of four weeks ago, and another of a fortnight – were missed. 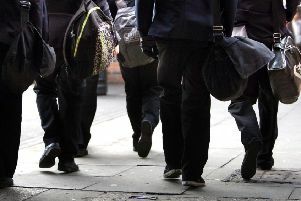 Mrs Milne, of Elmsleigh Gardens, Cleadon, said the cancelation had disrupted the schedules of fellow group members, some of whom had taken time off to attend the inquiry. She said: “We are pretty mad about this and angered. We don’t know why the council hasn’t got its bundle of papers in on time. “We had our bundle in on time a month ago, and we also supplied the skeleton outline of our case two weeks ago, as requested. “It appears the council’s lawyers have failed to submit anything, and now the inspector has ruled that the inquiry must be put back. Mrs Milne added: “We had built ourselves up for this, and some of our members had booked time off work. The council, which owns the land and opposes the group’s application, admitted it had erred. A spokesperson said: “The council acknowledges it was late with providing its further representations and evidence. It was prepared to go ahead with the public inquiry this week. Oakleigh Gardens Community Action Group, formed in November 2016, wants to protect a cricket and a football field at the north-west edge of Cleadon. The land is not thought to be subject to any planning application, but residents say one field was highlighted last year in a council planning strategy document. That has raised fears it may be consumed in a future development scheme. Their main claim to village green status is that they have enjoyed free and open access to the site for at least 20 years.